Dry eyes occur when an individual’s tears aren’t able to adequately lubricate the surface of the eyes. There are several reasons for inadequate tear production. Dry eyes may occur if the tear quality is poor or if the tear ducts don’t produce enough tears. Nighttime dry eyes, or dry eye symptoms that occur at night, can be troublesome. At night, when the eyes are not active, the surface of the eye can become dry and irritated. There are a couple of reasons that people experience dry eyes at night and upon wakening: partially open lids and low production of tears. Nocturnal lagophthalmos, the scientific term for incomplete lid closure at night, can cause the surface of the eyes to become dry and irritated. Some reasons for partially open lids are facial palsy and deformity of the lid. Sometimes this can happen when people have eye lid surgery. One method of closing the eye lid is to tape eyes shut at night with paper tape! 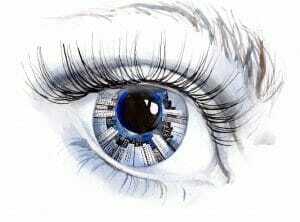 Meanwhile, a resting metabolism can cause drier eyes during sleep for those who suffer from chronic dry eyes. Decreased blood circulation can cause less blood flow to the eyes during sleep. Tear production can be increased during the night with TheraLife Eye Enhanced taken right before bedtime. However, there is a less drastic and more natural solution for nighttime dry eyes, moisture goggles from eyeeco.com and TheraLife Eye. Nighttime dry eye relief and better sleep are found with eye goggles that hold in moisture and promote eye comfort. Taking 4 capsules of TheraLife Eye Enhanced right before bed allows the body to naturally produce tears throughout the night. A simple test for partially open lids at night is to wet a gauze pad with clean water and tape it to the skin around the affected eye before bed. Make sure to use paper tape to avoid injuring the delicate skin around the eyes. Upon waking, if eyes are no longer dry at night, then it is likely that the lids are partially open during the night. 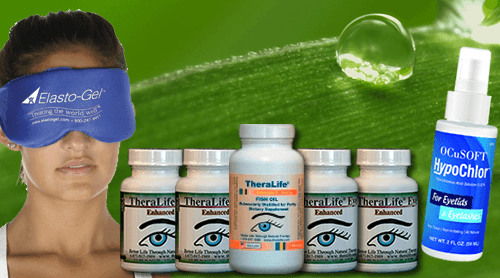 TheraLife Eye helps the body revive and restore natural tears for sustainable lasting relief. The TheraLife Eye Enhanced kit is recommended for new customers who suffer from nighttime dry eyes. When combined with the use of a sleep mask or moisture goggles, dry eye symptoms at night can be lessened or eliminated completely. Don’t suffer with dry eyes at night anymore. Get all natural relief with the complete line of TheraLife products.